Hydraulic Steering SystemsThe steering system on a boat is one of the most critical components of all, especially at high speeds with todays big horsepower motors. Boatpartstore.com strongly suggests that these steering systems be installed by a qualified/certified marine technician in order to prevent severe injury or even death. Boatpartstore.com will not be held liable for damages or injury. 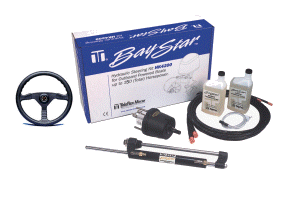 Teleflex BayStar hydraulic steering system for motors under 150 HP. 4.5 turns lock to lock. Requires at least a 32" splash well. 30' of hose included that can be cut to length. For single station single engine applications. Teleflex SeaStar I anti-feedback hydraulic steering system is designed for today's high speed applications. Recommended for all outboards 150 HP and below. Hose kits sold separately. 1990 and previous Johnson/Evinrude outboard motors require a different cylinder. Call us for those applications. 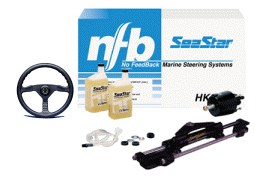 Standard hose kit (priced per pair) for Teleflex SeaStar & SeaStar Pro hydraulic steering system. 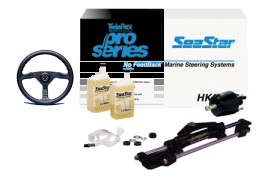 Standard hose kit (priced per pair) for Teleflex SeaStar I & SeaStar Pro hydraulic steering system. 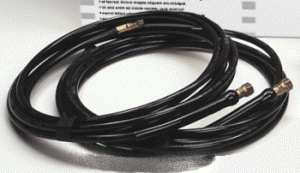 Kevlar hose kit (priced per pair) for Teleflex SeaStar Pro hydraulic steering system. Kevlar construction adds worry free safety and durability to your high horsepower application.